Antoinetta Marie is a Breton assassin who lives in the Dark Brotherhood Sanctuary in Cheydinhal. A newcomer to the Dark Brotherhood, and known to be a bit too talkative, Antoinetta lives a rather unexciting existence in the Sanctuary. She sleeps in the Living Quarters every night between midnight and 6am and spends the entire morning strolling restlessly around the Sanctuary Hall. At noon she enjoys a four-hour meal in the Living Quarters, then heads for the Training Room where she spends an hour on the bench before her training starts at 5pm. She spends the entire evening in sneak mode, tirelessly hacking away on the training dummy until she returns to her bed at midnight. 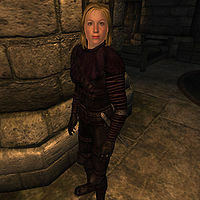 Antoinetta's only piece of equipment that she is using is the Dark Brotherhood's shrouded armor. She is armed with a silver dagger and carries the key to the abandoned house, the key to her chest, and a leveled amount of gold. She has an ability which grants a resist magic and a resist normal weapons spell. When you first meet her she will say: "I've heard so much about you. Welcome to our family!". Subsequently, to male players her greeting will be: "Welcome, brother. So good to finally meet you. I hope you're getting along all right." To female players she will be friendly as well: "Welcome, dear Sister! So good to finally meet you! I hope you're getting along all right. If you need anything, anything at all, you need only ask." She is also very candid about her adoration of Lucien Lachance, as she tells you if you inquire about him: "I will always think of Lucien Lachance as my savior. When he found me, I was living in a gutter, an inch away from death. I owe him everything." She will also give you her take on the mysterious Night Mother: "I've always wondered who the Night Mother really is. Some say she's an old woman who lives somewhere here in Cyrodiil, but I'm not so sure." When asked about the Sanctuary she will ask: "Have you ever lived on the streets, struggled to survive? This Sanctuary is my home. Here I have the safety and love I've searched for all my life." She will also explain her relationship with Sithis: "Sometimes, right before a kill, Sithis speaks to me. He whispers in my ear and fills my heart with the joy of suffering and death!" She also aspires one day to take over Ocheeva's role. When asked about rumors she will reveal: "Don't tell anyone else, but some day I'm going to have Ocheeva's position. Just you wait and see. Lucien Lachance knows real talent when he sees it." After the welcome, all her remaining dialogue will differ with her disposition. If it is higher than 70, she will say: "Hello, dearest Brother/Sister. Is there something I can help you with?" If it is between 30 and 70 she will say: "Yes? Is there something you need?" If it is lower than 30, she will downright hate you: "Why do you insist on annoying me?" The same disposition numbers will apply for her spontaneous reactions when you approach her: "So good to see you! Is there anything you need?" or "Hello again." to a hateful "Seeing you in this Sanctuary makes me wish I were back on the streets." When she exits conversation she follows the same pattern, either cheerful, uninterested, or downright hateful: "Good luck, Brother/Sister! I hope you don't get killed! I mean, um... well, you know! ", "I'll be seeing you, then." or "Just go! I can't stand the sight of you!" "I've traveled by prison ship. It was cramped and dark. There was little room to move around, but plenty of shadowy nooks to hide in. Remember that." "Ha! The great assassin needs help fulfilling a contract. You'll get no aid from me." "How do you plan on entering this man's house? Through the front door? Be smart and look for a more inconspicuous way in, like a cellar entrance." "That manservant is going to squash you like a bug! I can't wait to see what's left of you." "The Imperial Prison! Long did I languish there, in my youth, before the Brotherhood found me. The guards are strong and cruel. So very cruel...." "I can only hope the prison guards do to you what they did to me. You will know the true definition of the word 'horror.'" "I once slept in the Chorrol Chapel Undercroft. It's damp, cold... and cursed! Getting Motierre out of there may be a challenge." "It just so happens I am familiar with the Chorrol Chapel Undercroft. You're as good as dead." "Know what I'd do? Talk to Faelian, learn who he is. Maybe then you can lead him to a secluded place. Then, when you're alone... you know! He he he!" "I don't know what idea appeals to me more: you getting killed by this Faelian person or the Imperial Legion using your corpse as a target dummy." "Ooh, using poision [sic] is so deliciously evil! I once poisioned [sic] my aunt's stew, and she fell over dead with her face right in the bowl! Ha ha ha ha ha!" "I think it says something about Ocheeva's faith in your abilities when she gives you a contract to kill someone who isn't even conscious..."
"Remember, you must make the other guests feel comfortable. Make them like you. Make them TRUST you. Then bathe in their blood! Hehehehe!" "Why do you get to go to a party? It's not fair. I hope they discover the truth and kill you in your sleep!" "Oh! You're being sent to kill Phillida? I hope the Rose of Sithis pierces his heart and sends his soul screaming into the Void!" "You're being sent to assassinate Adamus Phillida? Oh, finally Ocheeva has come to her senses! You'll be killed, and we'll finally be rid of you!" She seems to be known around the Sanctuary as the "gossip spreader", as some members will comment when talking with each other: "Word certainly gets around fast, doesn't it? Don't tell me -- Antoinetta has been running her mouth off again." This page was last modified on 9 June 2016, at 09:41.